The Greater Cincinnati startup scene is diversifying and growing, which is creating opportunities for new types of startup launch platforms. Cincinnati-based Differential is a new company that is leveraging a different type of service and funding model to help startups accelerate their launch. Part angel investor, accelerator, digital studio, and lean startup consultant, Differential aligns its interest with startups by working for equity. As the startup industry expands, so too have the models that support it. With this expansion comes widening gaps in any ecosystem, and the typical accelerators, angel groups, incubators, small business hubs, and other common platforms for startups cannot fill the voids quickly enough. Startups have various needs, and some of these traditional models are either not appropriate or not accessible. The founders at Differential see holes in the greater Cincinnati startup scene, and they are not alone. As cofounder Tim Metzner explains, “We’ve had over fifty conversations with key players in the community [including] investors, entrepreneurs, [and] startups and have yet to find anyone who doesn’t see a need for an organization like ours. In fact, what really got the wheels in motion was that about the same time we started meeting about creating Differential, I was approached by Allos Ventures about coming up with ideas to help solve a lot of the same issues we had identified.” Allos Ventures is informally engaged with the Differential team in part to increase the volume and diversity of area startups that make it to early-stage funding potential. According to Metzner, both Differential and Allos see similar challenges in the local startup ecosystem. Some of the challenges include the lack of focus on B2B startups, as Cincinnati tends to favor the B2C consumer-facing market. 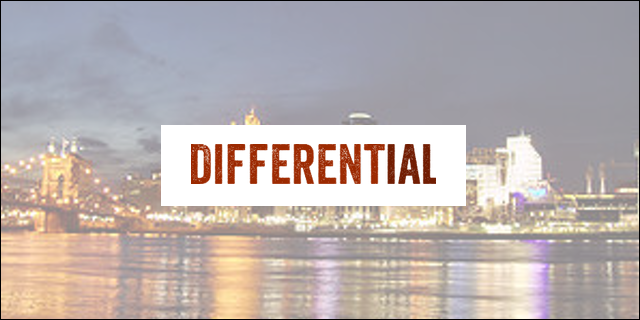 By fostering a stronger startup enterprise market, Differential hopes to increase deal flow in the region by providing more options to potential investors. Another common issue, not just for Cincinnati startups, is the challenge in finding the right talent to refine, build, and test an idea. Differential leverages its resources, experience, and connections to validate, launch, and scale ideas with sound revenue models. It also can perform design and development itself, a key resource for its startups. In return for their services, Differential seeks equity, and in some cases, a combination of equity and cash. The target equity stake is between 20 and 40 percent – which is higher than the typical accelerator or angel. This equity allotment is earned over time, however, and is based on defined milestones. The founders constructed it this way to ensure interests remain aligned throughout the relationship. Additionally, the equity stake is higher due to the amount of work and time Differential will invest in each startup. Unlike an accelerator or angel, Differential will serve the startup actively, providing the targeted service and help that is directly needed for that specific startup. In many ways, it may be helpful to look at Differential as a cofounder rather than a service company. While this model is unique in Cincinnati, there are other similar models that have emerged in other startup communities. Betaworks in New York, Sandbox Industries in Chicago, Science in Los Angeles, and SproutBox in Bloomington are just some related examples. Now with Differential, Cincinnati has a different platform for its startups to launch from.